SAN DIEGO, CA--(Marketwire - Feb 26, 2013) - Slacker, the world's most complete music service, is now available on the Xbox360® video game and entertainment system from Microsoft, allowing Xbox LIVE subscribers* in the U.S. and Canada to listen to millions of songs and hundreds of expert-programmed stations for free, including a new videogame music station curated by popular gaming culture blog, Destructoid. The app is now available through the Xbox LIVE Marketplace. 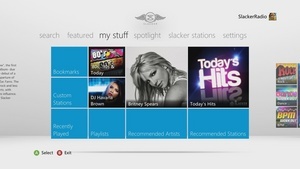 Slacker for Xbox LIVE® gives users access to one of the world's largest music libraries and hundreds of expert-programmed stations covering every mood, genre or activity right on their TV and voice-controlled using the power of Kinect for Xbox 360. The all-new Slacker music guide makes music discovery fun and easy with the latest music news, artist interviews and recommendations from Slacker's team of music curators. Listeners can also customize the experience with news and sports from ABC and ESPN or use new fine-tuning controls to personalize Slacker's music stations, with newer, older or more popular songs. "Slacker brings the world's most complete music service to Xbox LIVE Gold subscribers in the U.S. and Canada for free*," said Craig Rechenmacher, Slacker's Chief Marketing Officer. "Whether you're into country, hip hop or want to listen to the soundtrack from your favorite game, Slacker's team of music experts make it easy to find and discover the world's best music from the comfort of your living room."